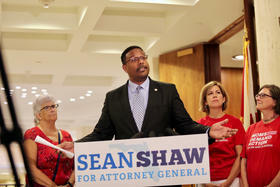 Democratic Attorney General candidate Sean Shaw is promising if elected he’ll create a task force to deal with gun violence. Shaw says its members would come from a range of fields like state and local government, law enforcement, education and mental health organizations. He has already prioritized issues for the task force to address. "We need a collaborative approach to addressing complex issues like Stand Your Ground, background checks, 3D printing of guns, reforming the concealed carry permitting process, local preemption laws, and the rise in deadly school shootings," Shaw told reporters Thursday. If the task force comes to fruition, Shaw says he will use its recommendations to call for legislation and regulations during the 2019 Legislative Session.